Adjustable dumbbells differ from traditional dumbbells in that they allow you to change weights as per your strength thresholds and exercises. You won’t find adjustable dumbbells in many public gyms but you will find them in home gyms across the country. The reason for this is their versatility and space saving qualities. This is why they’ve gained popularity in recent years. This rising popularity means that there are now multiple companies in the market manufacturing different types of adjustable dumbbells. 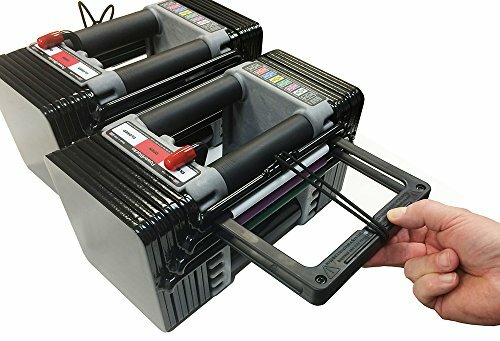 While you’ll find many smaller companies vying for the quickly growing market, Yes4All, Bowflex, and Power Block are, by far, the most reliable and popular. Having so many manufacturers in the market is a good thing because it’ll give you a wide variety of options. At the same time, this variety will make finding the best adjustable dumbbells a challenge. For this reason, we’ve done the work for you by evaluating all the different options in the market. Before we give you our top picks, however, we recommend you learn a little about adjustable dumbbells. Why Are Adjustable Dumbbells Better Than Barbells for You? Why Are Adjustable Dumbbells Better Than Kettle Bells for You? 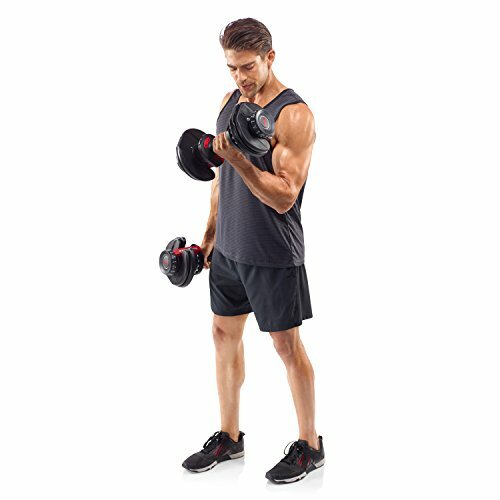 What Weight Increments Are Possible With Adjustable Dumbbells? What Are The Different Types Of Adjustable Dumbbells? If you're setting up a home gym, as your interest in best adjustable dumbbells suggests, then you're either a beginner or are using the home gym for muscle maintenance. In both cases, adjustable dumbbells will be a better pick for you than barbells for the following reasons. Dumbbells take less space than barbells. Adjustable dumbbells take even lesser space than traditional dumbbells. Since home gym owners usually face space constraints, adjustable dumbbells can give them more options. Barbells are used for compound exercises where more than one muscle set is used. These types of exercises are mainly used to increase muscle strength. Adjustable dumbbells can be used to isolate muscles and, hence, deliver more specific results. You’ll need a spotter if you're trying to push your limits with barbells for the sake of safety. However, adjustable dumbbells are safer as there is no risk of being pinned down when you're unable to complete a repetition. Adjustable dumbbells are ideal for managing strength imbalances between the arms. The same cannot be said for barbells, where one side can easily compensate for the other side. Dumbbells, adjustable or otherwise, are excellent for circuit-based exercises and Cross Fit regimes. Barbells tend to be more cumbersome which is why they're not ideal for exercises that involve a lot of movement. Changing weights is much easier with adjustable dumbbells than with barbells. Kettle bells can be described as cannon balls with thick handles. The reason why they're not so common in gyms is because they're a relatively new addition to the fitness scene. They're also highly demanding and may not be suited to you. Here are some reasons why. Kettle bells, like barbells, are used for compound exercises. They may increase your strength but they will not help you develop individual muscles. In contrast, adjustable dumbbells can help isolate specific muscle sets and give your body a much more toned appearance. Kettle bells are dangerous when used without supervision because there use in explosive exercises makes them difficult to control. Explosive exercises are difficult to discontinue in mid-repetition because of inertia. Since most home gym users don’t have expert supervision, using kettle bells can result in serious injuries. Adjustable dumbbells, again, are safer because it’s easier to control them mid-repetition. Adjustable dumbbells are more versatile than kettle bells. They can be used for basic exercises as well as motion-focused exercises while kettle bells are generally only used for the latter. Adjustable dumbbells offer weight increments which minimizes the need for other dumbbells. With kettle bells, you'll need to have more than a single set for when you need to handle greater weights. The biggest strength of adjustable dumbbells, as their name suggests, is that they allow you the flexibility of multiple weights on the same bar. Generally, adjustable dumbbells allow weight increments of either 2.5lbs or 5lbs but there may be some models that allow even 10lbs increments. Weight increments depend on two things. The first is the manufacturer and the second is the maximum weight of the adjustable dumbbells you’ve purchased. The vast majority of adjustable dumbbells you'll find in the market have a maximum weight of 50lbs with weight increments of 2.5lbs. However, a few adjustable dumbbells can go up as high as 100lbs with increments of 5lbs. Be advised that the latter variety of adjustable dumbbells almost always turn out to be more expensive than the former type. You should also note that Power Block adjustable dumbbells offer something that other manufacturers don’t. They offer expansion packs on their adjustable dumbbells that can come in very handy when your strength and lifting capacity grows. The way their expansion packs have been designed, in fact, takes the natural progression of an individual’s strength into account. Even with the Power Block option available, it is advisable to get two pairs of adjustable dumbbells. If you get two, the first will go up to 50lbs while the other will start at 50lbs and go up to 100lbs. There may be multiple ways of classifying adjustable dumbbells but the most reliable criteria will be their mechanism. You can group most brands of adjustable dumbbells in the market into three categories – Spin-Lock, Weight Selection or Dial, and Pin Selection. Here is a brief overview of each of these types. Design-wise, these are probably the simplest of the three. 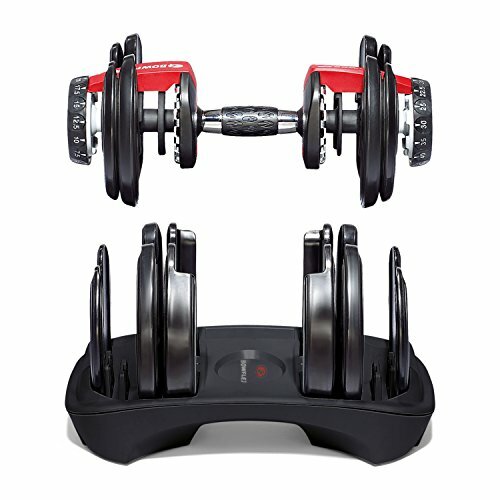 Spin-lock adjustable dumbbells comprise a pair of rods and a number of plates. The plates are loaded on both sides of the provided rods and the plates are locked in with spinning nuts at both ends. Owing to their simple design, spin-lock dumbbells are the cheapest variety of adjustable dumbbells available in the market. However, their design also makes changing weights a time-consuming process. This means that they're unsuitable for circuit-type exercises and Cross Fit routines. Yes4All manufactures spin-lock adjustable dumbbells. Pin selector adjustable dumbbells require the user to manipulate two interlinked pins to pick the right weight. They come as a set that contains multiple square plates with a square bar in the middle. Managing the pins means that certain weights get locked into the bar while others get left behind on the base. These types of adjustable dumbbells take the least amount of space which makes them very beneficial for home gym users. In terms of cost, pin selector adjustable dumbbells are more expensive than spin-lock adjustable dumbbells. However, their square shape can be a problem with certain exercises. Power Block is the most popular manufacturer of pin selector adjustable dumbbells. Dial adjustable dumbbells look like advanced versions of commercial gym dumbbells. They boast of a round design with dials at both ends of a bar as well as multiple plates. Turning the dial on these dumbbells changes their weight profile. Because of their mechanism, these are the most user-friendly type of adjustable dumbbells. At the same time, these are the most expensive adjustable dumbbells available in the market. Most popular dial adjustable dumbbells are manufactured by the fitness giant Bowflex. As is evident from the above, each type of adjustable dumbbells has its own pros and cons. This means that different types will suit different needs and requirements. For example, if you're facing severe space constraints, then you'll find pin selector adjustable dumbbells to be the most valuable. Similarly, if money is a major concern, then you may not be able to consider either dial or pin selector adjustable dumbbells. You'll, of course, choose dial adjustable dumbbells if you're used to intermediate levels of training. It is because of this reason that we’ve picked out best adjustable dumbbells in each of these three categories. Here are our picks along with our reasoning. Power Block is credited with developing the concept of adjustable dumbbells. So, it isn't surprising that one of their products has become our overall pick in addition to being our best pick for pin selector adjustable dumbbells. 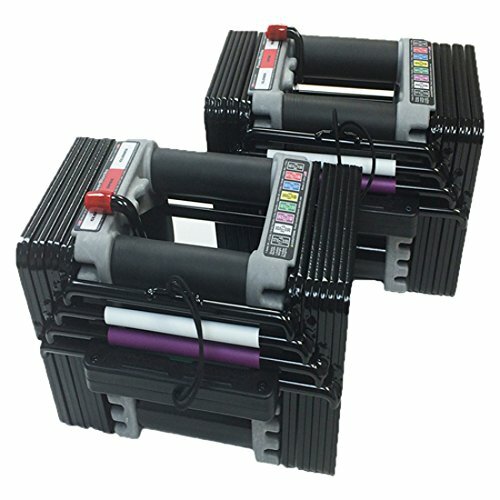 Probably because Power Block was first to the scene, their dumbbells have the most advanced and unique design in the market. After analyzing multiple Power Block adjustable dumbbells, we found the Power Block Elite Dumbbells to be the best in virtually every variable possible. However, that doesn’t mean that they are flawless. They have their flaws too but they're fairly negligible and minor. Let’s see how the Power Block Elite Dumbbells fare when individual variables are considered. We do want to point out that at the time of this writing waiting time to receive your power blocks was 1 to 3 months which is a long time; hopefully this simply a seasonal issue and will be resolved shortly. If you want your dumbells as quickly as possible Power Block may not be your best bet. Power Block Elite Dumbbells offer adjustability through two mechanisms. The first is the pin selector mechanism where you manage the provided U-shaped pin to get your required weight. The other is for more refined weight adjustments. This is done by managing two 2.2lbs (1Kg) cylindrical bars located at the underside of the square dumbbell. Both mechanisms are sound and reliable. The cylinders are locked in cylindrical housing while the U-shaped pin has a magnetic lock. Therefore, you won’t have to worry about either of them coming loose in the middle of your exercise. While the pin selection mechanism is fast and easy, the cylinder mechanism can end up being cumbersome and annoying after a while. However, the majority of people will not be using the refinement feature. Most people either leave the two cylinders in or leave them out. For us, the extra time or effort taken to manage the cylinders is not a major problem. The design of the Power Block Elite Dumbbells is their biggest strength and biggest weakness. At the same time, it must be said that they boast of the most unique design on the market. They're square in shape with four bars surrounding the central handle. The bottom two bars hold the cylinders we spoke about above while the top two bars are supposed to be wrist guards. 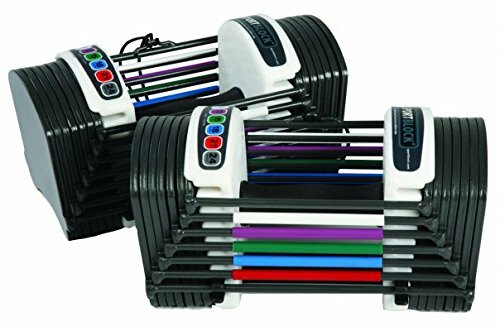 Their unique design allows a single pair of Power Block Elite Dumbbells to replace no less than 16 pairs of dumbbells. The amount of space you’ll save is staggering. This cage-like appearance can make them feel a little bulky and may put off some potential buyers. The downside of this unique square shape is that it can make certain exercises difficult to perform. Size is a major consideration when it comes to adjustable dumbbells too. With some adjustable dumbbells, you'll find that the bar is too long even with lighter weights. This is not a problem with the Power Block Elite Dumbbells. Here, the length of the dumbbells is directly proportional to your selected weight. The length of the handle only increases at higher weights. Luckily, the length of the dumbbells won’t matter at higher weights because the stabilizer muscles will also be well-developed. The Power Block Elite Dumbbells truly excel in this category. These dumbbells exceed all their competitors when it comes to their weight range. The Power Block Elite Dumbbells are available in three trims – the 50, the 70, and the 90. They're simple to decipher. The 50 offers a weight range of 5lbs to 50lbs, the 70 offers 5lbs to 70lbs, and the 90 offers 5lbs to 90 lbs. Having these options is great but they aren’t their best feature. Their best feature is the expansion kits. If you're regular with your weight training, you're soon going to develop your strength to a point where even the 50lbs setting will seem easy. With most adjustable dumbbells, you'll end up buying another pair at this point. But with the Power Block Elite Dumbbells, you'll be able to buy expansion kits. Two expansion kits will be available to you - the 50lbs to 70lbs expansion kit and the 70lbs to 90lbs expansion kit. Weight distribution can be a problem with most modern adjustable dumbbells, mainly because of their designs. In the case of the Power Block Elite Dumbbells, weight distribution is only a problem at lower weights. If you remove one of the 2.2lbs cylinders, then you may feel the dumbbells rotating in your hands and putting unexpected pressure on your wrists. However, if you leave both cylinders in place or remove both of them, this minor issue goes away. At higher weights, you can manipulate the cylinders as you want without worrying about weight distribution problems. Traditionally, it can be dangerous if the weight distribution is suspect at higher weights. The fact that at higher weights, the Power Block Elite Dumbbells don’t have weight distribution problems is a plus in their favor. It is also important to add here that the two bars above the main handle are designed to support your wrists if there is any weight imbalance. The grip on the Power Block Elite Dumbbells is ergonomic and reliable. You wouldn’t have to worry about the dumbbells slipping out of your hands if you possess the standard grip strength. However, a minor flaw you should know about is that the pins protrude very slightly on the outside of the dumbbells. These pins could snag on your clothes or even scratch you slightly. This is a minor flaw in our eyes because you can just keep the opposite side of the dumbbells towards your body to prevent snagging problems. In any case, weight training shouldn’t be done in loose clothes. 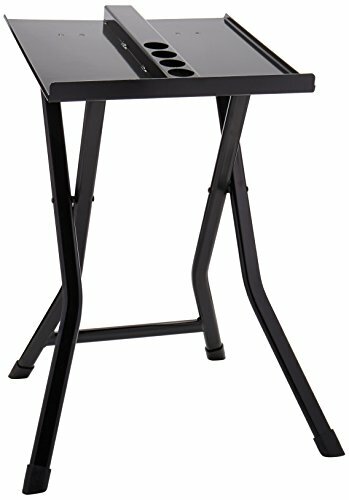 If you're considering the Power Block Elite Dumbbells, you should definitely also consider a weight stand that can hold them. Power Block offers stands designed specifically for Power Block Elite Dumbbells. These stands will hold the dumbbells at just the right height to keep your training uninterrupted. Also, at higher weights, lifting dumbbells off the floor can not only be difficult but also dangerous. Spin-lock adjustable dumbbells come closest to traditional dumbbells, if you consider how they feel in the hand. They also happen to be the most affordable option when it comes to adjustable dumbbells in the market. This quality, combined with their low price, is what makes Yes4All Adjustable Dumbbells so attractive to so many people. In fact, if you wanted the maximum bang for your buck, then these dumbbells have to be on your shortlist. This is why Yes4All Adjustable Dumbbells are not only our pick of all types of spin-lock adjustable dumbbells but also our pick of adjustable dumbbells priced below the $200 mark. What is even better is they come with enough weights for 100lbs. PER DUMBBELL making them perfect for bodybuilders and competitive strength athletes who need to be able to train at home. The only negative that we found with these is that you do need someplace to store all the extra weights and you will need to change the weights on each dumbbell as you go from exercise to exercise; but again those are small gripes. The weight management mechanism of Yes4All Adjustable Dumbbells is extremely simple. To change weights, all you need to do is unscrew the chrome locks, place the required cast iron plates, and then screw the locks back on. The simplicity of this mechanism means that it is free from unexpected hitches. At the same time, this also means that changing weights on these dumbbells is time consuming. The direct result of this is that Yes4All Adjustable Dumbbells are not ideal for circuit training of any kind. Yes4All Adjustable Dumbbells boast of a very simple design. 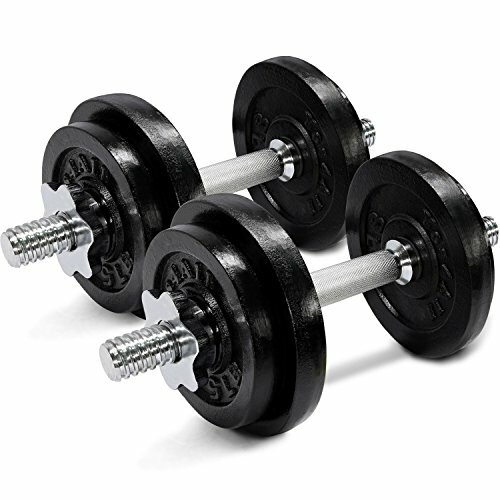 These dumbbells are basically two chrome textured bars or handles, multiple cast iron plates, and two pairs of chrome spin-on locks. In fact, all their qualities and flaws stem from these basic components and how they fit together. Because Yes4All Adjustable Dumbbells are so similar to traditional dumbbells in design, there are no size related issues whatsoever. The handles or bars on these dumbbells are of standard lengths. This means that they’ll be very familiar to you if you’ve been working out in a commercial gym till now. Yes4All Adjustable Dumbbells are available in multiple weight configurations including 40lbs, 50lbs, 52.5lbs, 60lbs, 105lbs, and 200lbs. For most people, the most economical option would be to get the 105lbs configuration. The 105lbs configuration will allow for both beginner and intermediate level exercises. The 200lbs configuration is most suited for competitive level exercises. It should also be noted that expanding Yes4All Adjustable Dumbbells is just a matter of getting more cast iron plates. 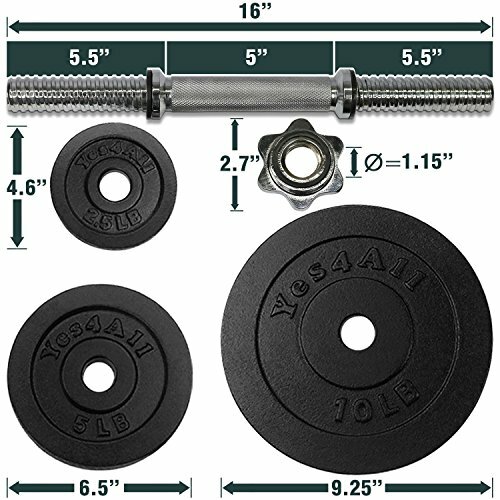 Weight distribution will never be a problem with the Yes4All Adjustable Dumbbells, unless the cast iron plates are not fixed properly with the spin locks. 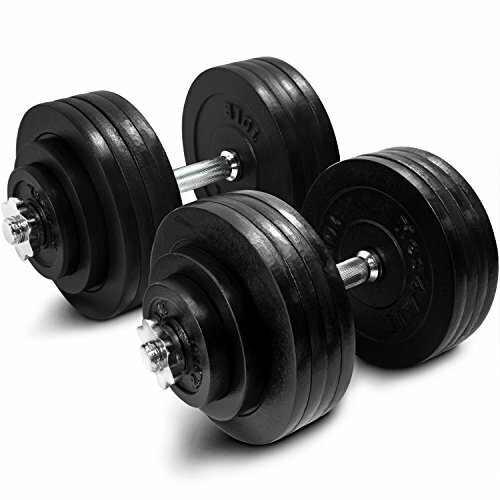 The standard length of the handle and uniform balance of the plates makes these dumbbells very stable and reliable when it comes to weight distribution. Another advantage of Yes4All Adjustable Dumbbells is that their cast iron plates can end up serving you well on a barbell as well. Therefore, if you get a barbell, then you can use the weights from these dumbbells. Bowflex is one of the most highly-regarded brands in the fitness industry. They're credited with introducing the dial adjustment system that ended up revolutionizing the fitness industry. Of all the Bowflex adjustable dumbbells, our top pick is the Bowflex SelectTech 552 Adjustable Dumbbells. They're our top pick in this category simply because they have the most advanced dial adjustment system in the market right now. This makes these dumbbells the best “traditional dial” adjustable dumbbells in the market. The latest dial adjustment system isn't the only quality that has made the Bowflex SelectTech 552 Adjustable Dumbbells one of the bestselling adjustable dumbbells in recent years. Our following review contains all the other advantages of these dumbbells. Our only complaint with these are that they only go up to 52.5lbs. making them not really suited for bodybuilders or strength athletes however for the majority of fitness enthusiasts this is more than enough weight. As we’ve mentioned earlier, the biggest draw of the Bowflex SelectTech 552 Adjustable Dumbbells is their weight adjustment mechanism. The dial system is so smooth, so easy, and so innovative that it will take your breath away the moment you lay your hands on it. All you'll need to do is twist the dials on both ends of the dumbbells to the right weight setting and you'll be set to go. It is really that simple. Depending on your weight setting, the relevant plates will get attached to the handle while the others get left behind on the base or cradle. These dumbbells have the same shape as traditional dumbbells but that is where the similarities end. When the Bowflex SelectTech 552 Adjustable Dumbbells was released, their design was hailed as groundbreaking in the industry because of the dial adjustment system. The dial adjustment system is formally called the SelectTech Dial-a-Weight Adjustment System by Bowflex. Turning the dials is so simple that changing weights on these dumbbells can be done in a matter of seconds. In terms of design components, these dumbbells consist of a central handle that has inbuilt brackets. The handle fits into a series of weight plates placed on a base or cradle. When the dial is turned the pertinent brackets lock onto the relevant plates. Therefore, when you pick up the handle, only the locked plates come out with it while the others get left behind. Because of the way the dial adjustment system works, the length of the dumbbell is always longer than standard dumbbells. This is the primary disadvantage of the Bowflex SelectTech 552 Adjustable Dumbbells. The longer length of the handles means that the dumbbells can end up restricting the full movement in certain exercises. For example, a simple exercise such as bicep curl can be problematic for some people since the long length of the handle may result in the chest getting in the way of a full curl. Similarly, in chest press, the two dumbbells can get in each other’s way when the arms are fully extended. 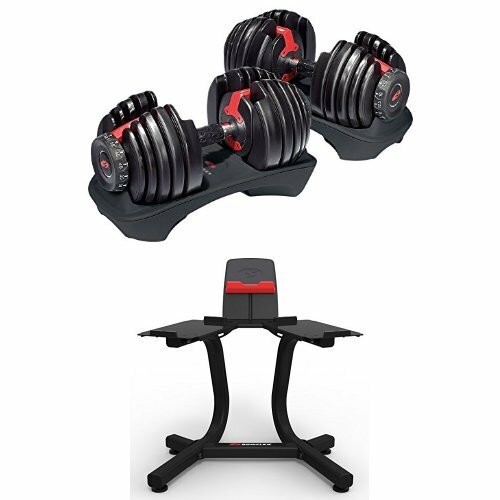 The weight range available with the Bowflex SelectTech 552 Adjustable Dumbbells is sufficient for most beginners but individuals with intermediate or advanced fitness regimes may find the range to be a little limiting. 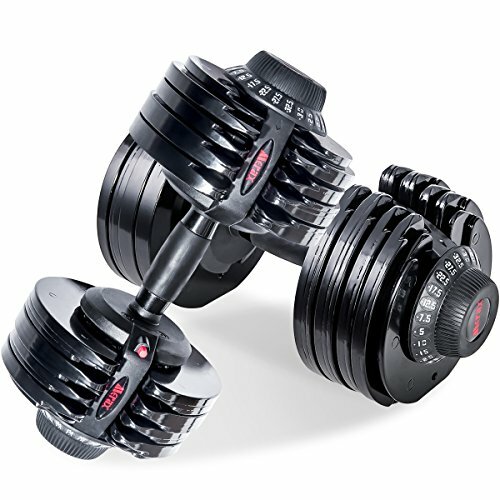 The Bowflex SelectTech 552 Adjustable Dumbbells weight range starts at 5lbs and goes up to 52.5lbs. The SelectTech 1090 with a weight range of 10lbs to 90lbs is also available but we’ll treat that as a separate set of dumbbells. While the maximum weight on the SelectTech 552 may be slightly lower than its competitors like Power Block, the increments are a definite plus point. 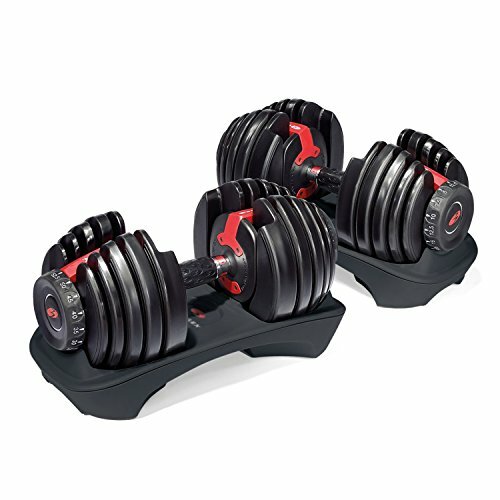 On the Bowflex SelectTech 552 Adjustable Dumbbells, weight increments are to the tune of 2.5lbs for the first 25lbs and then 5lbs for the next 25lbs. The initial smaller increments can be very beneficial for beginners trying to get used to their new routines. Weight distribution is also slightly suspect on the Bowflex SelectTech 552 Adjustable Dumbbells. This is because the plates on the cradle are not perfect circles. The top of the plates have a gap in them which is needed for the handle to pass through them. Because of this break in shape, the balance of these dumbbells can get a little iffy. This problem will be most pronounced at higher weights and you may feel undue pressure on your wrists because the dumbbells are always trying to rotate forward. While the longer handles are seen by many as a downside, they have a positive effect as well. Because of the longer handles, you will find your stabilizer muscles being worked harder. Very few exercises will help you develop your stabilizer muscles but with the Bowflex SelectTech 552 Adjustable Dumbbells, the usual exercises may result in them being developed automatically. If the Bowflex SelectTech 552 Adjustable Dumbbellsappeals to you, then you should also consider the Bowflex SelectTech Dumbbell Stand with Media Rack. The stand will make it easier for you to handle and store your dumbbells. Additionally, we found the media rack to be pretty cool as it takes away the need for us to find a surface to place our media devices. e looked at three of the best adjust table dumbbell models currently on the market today. Our top pick is the Power Block Elite Dumbbells even though you may have to wait a while for them to ship. 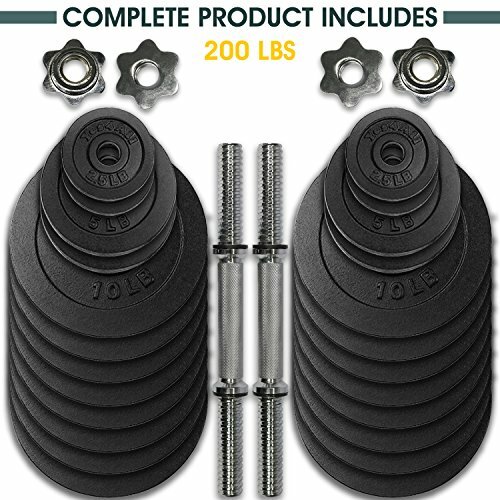 They are more expensive than the other dumbbells listed however they are the most expandable, take up the east space and are the easiest to store. 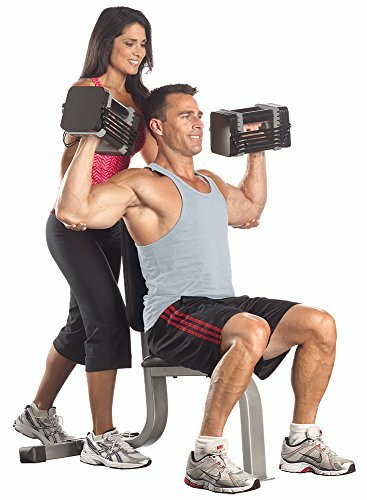 Our pick for cheapest adjustable dumbbell goes to the Yes4all dumbbells and they are a great buy being the most inexpensive dumbbells on this list even in the largest size which is 100lbs per dumbbell making them perfect for serious bodybuilders and strength athletes who are on a budget. The downside is that you will need room to store all the extra weight plates and it will take a little bit of time to change weights between exercises. Finally, we have the Bowflex Select Tech 552 these are the closest that you can get to “traditional” dumbbells these dial selector adjustable dumbbells come from a Bowflex a known and trusted name in the fitness industry. The Bowflex dumbbells are easy to store and it is very quick to adjust the weights on each. The only downside is that the dumbbells only go to 55.2lbs. per dumbbell which is enough for most people but would not really be adequate for bodybuilders or serious strength athletes. We hope you have found our reviews helpful and you can now buy the adjustable dumbbell set that is best for you and your needs!